I get this comment a lot. It is usually said in jest with a laugh. It comes from friends, close friends, well meaning friends . . . and sometimes acquaintances. I laugh and usually nod my head in agreement, because sometimes I feel a little crazy. I know they don’t mean anything negative by it, they are simply expressing their surprise or amazement at some of choices we make. I take absolutely NO offense at it at all!! I don’t mind being thought of as crazy, especially when I am doing what I think is best. Of course I also get the comments in a not so nice way, said with a tinge of superiority or even disgust, usually accompanied by an eye roll. And I am sure most of those people are actually saying it behind my back too “she is CRAZY, can you imagine, I would never do that!!!”. That is fine too and it doesn’t bother me because like I said, I am doing what I think is best. Actually I can understand the crazy label being applied to many of our choices that are outside the norm and outside of most peoples comfort zone. For example . . . .
Homebirth (or even unassisted birth). For those who are unfamiliar with the safety of homebirth and unhindered birth in general, are afraid of birth, who think that birth is a medical event that needs the hospital, or for those who just feel safer with that medical ‘back up’ I can totally understand them thinking that homebirth is ‘crazy’. I may not agree, but I can understand why they would feel this way. Though I have found that when people do more research on it they tend to warm up to the idea. But it isn’t for everyone and personally, I can relate because I have often felt the opposite . . . like those who birth in the hospital (without a medical indication) placing their births in the hands of Dr's and hospital regulations are crazy, LOL!! (said in jest of course) So I understand the feeling! Natural Health etc. – people get freaked out at the thought of not vaccinating! Diseases are scary (though some of us believe the vaccine is scarier). They don’t understand just watching a fever instead of trying to bring it down, or not giving a kid Tylenol or cold meds at every ache or sniffle, or even not taking them to the dr for their ‘well baby’ checks. We are such a medically minded society who looks to Dr’s to answer and even solve all our health problems, that it is often outside of peoples comfort zone to think of not utilizing this service. If someone wants to think me the crazy herb lady who doesn't have meds in her house I am cool with that! Elimination Communication – Taking your BABY to the potty? I don’t even need to explain why this sounds crazy, LOL ! (though I swear when you realize they can communicate this need it makes perfect sense). But then there are some things about parenting that just seem very natural and normal and instinctual to me. 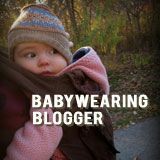 When it comes to things like breastfeeding, babywearing, co-sleeping, I don’t understand how something so primal and so much a part of human nature (nurturing your child) can be seen as crazy. I still don’t mind the crazy comments about these things, and I certainly don’t take offense, I just have a harder time understanding the sentiment. So I was lying in our big bed last night in the dark. All 6 of the kids had decided to sleep in there with us (Xian said he felt like being cozy). Dagyn was nursing, his body cuddled into mine, his hand on my arm and his little feet kneading at my belly. I could feel 2 yr old Thrace's body, cuddled up to my back. And I thought . . . .
Is it crazy to love this? Is it crazy to love cuddling with these babies? Is it crazy to take joy in meeting my baby’s needs? Is it crazy for wanting to provide them with the best nutrition in the world, for as long as they need it? Is it crazy to look for reasons to be with them, instead of looking for reasons to be apart? Is it crazy to want to cherish every moment because I know they grow so fast? Is it crazy to embrace my mothering instincts, despite the fact that it goes against the mainstream? Is it crazy to say yes, when society says I should say no? Is it crazy to respect my older kids needs and desires without judgment? Is it crazy to listen to what my baby is telling me? Is it crazy to want to hold my baby as much as possible, especially when he is telling me he needs it? Is it crazy to sacrifice my time, my body, and sometimes my mental sanity for the benefit of my children? Is it crazy to give up my wants for my children's needs? Well if all of this is crazy, then I am certifiable!! Go ahead and lock me away! I’ll admit I am crazy about my kids and making sure I am doing what I feel is right by them! I mean, don’t all of us parents have a little crazy in us? And that is why I happily accept your crazy label even if it is meant as a negative, and if it is . . . . Then I’ll take your crazy and raise you a side of glaring indifference! The picture that prompted the post! 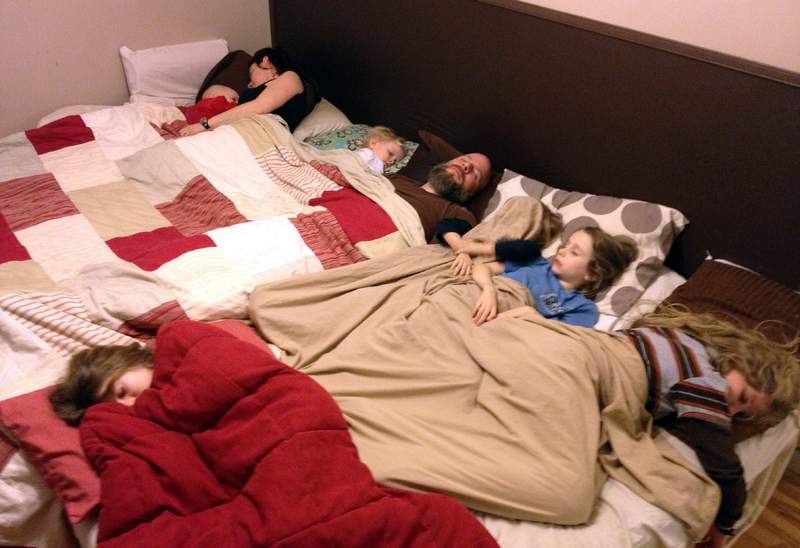 The other day I posted a picture of our big bed with all 8 of us on facebook. I often get people wondering how we make it work so I thought some would find it interesting (and I'll do a whole blog post about it at some point). Those facebook friends who know how our family does things (and/or do things in a similar way) didn’t think a thing of the picture, but I am sure there were plenty of friends unfamiliar with how we do things, who were shocked by it! Something I hadn’t even thought about when I posted it!! And even though the comments I got on it were positive, I could only imagine that there were plenty of 'crazy' comments that would never be shared with me! I don't think anyone actually said 'crazy' about that picture in particular, but the responses of surprise by some people got me thinking about how often I am called 'crazy' for my choices and wondering how many were at home looking at it thinking it was crazy but just not saying it! I love this post. I am a new mother of a [very] strong willed little girl. She just turned 11 months and almost all of my fellow mothers (amazing # of babies born in 2011 among my friends!) think I am this granola eating, crunching, tree hugging, crazy hippy. I wear my daughter, we sleep together, I breastfed her, snuggle her, and love her always. I have friends who work and simply cannot understand how you "deal" with your children all day. Well, I don't. I enjoy her. I think that's what I was made to do. This post makes me happy and not feel so alone when surrounded by very mainstream mothers. Any parent relying on what other people think or say about them is doomed from the start. There is too much of that in this world, and certainly in this country. You guys seem like you are doing fine. And I say that as an outdoors dad who has made very different choices than you. As I say about my own choices, as long as they are legal, make sense to us, were consciously made by us, and we are ready and able to deal with the positive and negative outcomes of those choices..........who cares what others think? Let them judge and rock on.